File photo: Flood in Chamdo. (TibetanReview.net, Nov16, 2018) – A bridge in Garze (Tibetan: Karze, or Kande) Tibetan Autonomous Prefecture, a vital link to Tibet Autonomous Region (TAR), was washed away on Nov 14 after water was discharged from a landslide-formed lake on the Jinsha River (Tibetan: Drichu) through a man-made channel, reported China’s official Xinhua news agency Nov 14. A further Xinhua report Nov 15 said the raging flood later toppled least 8,000 houses in downstream Yunnan Province while losses in Deqen (Tibetan: Dechen) Tibetan Autonomous Prefecture in the same province were being assessed. Official media reports said part of the 270-metre-long Zhubalong Jinsha River Bridge, Completed in 2007 in Garze Prefecture, was destroyed by the discharged water. As a result, traffic was halted on the Sichuan-Tibet Highway, a pivotal route linking Sichuan and TAR. The discharge of water from the barrier lake was stated to have been effected on Nov 13 afternoon. It did not result in any casualty and helped to lower water levels of the barrier lake, the reports added. 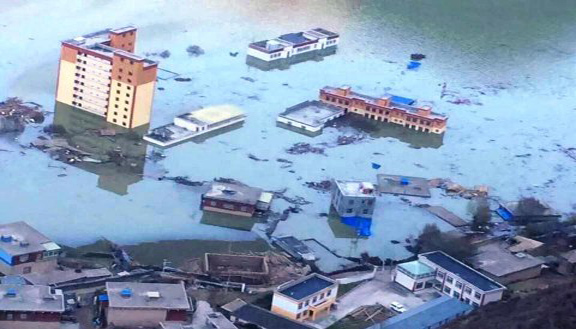 The Nov 15 Xinhua report said the torrential water entered Yunnan Province on Nov 14, toppling at least 8,000 houses and damaging another 16,330 houses in Yulong County of Lijiang City. Some 1,800 hectares of farmlands were reported to have suffered damages, although no casualties had been reported. Roads and hydrologic facilities were reported to have been damaged and 17,000 people affected. The report cited authorities as saying losses were still being assessed in Deqen Tibetan autonomous prefecture, another hard-hit area in Yunnan. An initial landslide on Oct 11 blocked the Jinsha River and formed a barrier lake near Polu (Chinese: Bolo) Township in Chamdo City’s Jomda (Jiangda) County. Water levels returned to normal on Oct 14 with no casualties following a breach. However, a second landslide near the same spot on the Garze side blocked the river again on Nov 3. The Jinsha River runs between Chamdo City and Karze Prefecture.